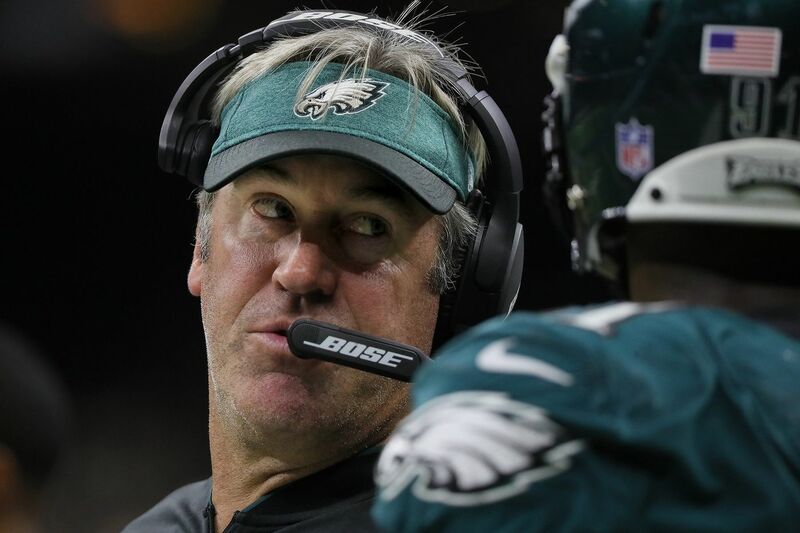 Can Doug Pederson keep this team together? NEW ORLEANS – The visitors' locker room at the Superdome is split into two rooms – a larger one for the offense and a smaller one for the defense. When the door opened after the Eagles' embarrassing 48-7 loss to the Saints, and a few media members walked into the defensive side, Nigel Bradham had a message for those who opted to turn right. "Don't even come on this side," the Eagles linebacker said. "Go to the other side." It's unclear what Bradham meant. Was he leaving it up to offense to explain the carnage, as if it had more to do with a blowout loss? Or was he shooing reporters away because of the disparity in room size? An answer was unmanageable because Bradham, once the most accountable of Eagles, slipped out, much as he has all season. You can tell a lot about a team in the immediate moments after a devastating defeat. The Eagles had been treading water through the first nine games, convinced they were better than their losing record indicated, because their five losses were each by one score. But there were no ifs, ands or buts about Sunday's shellacking. The Saints are very good. They may be great. But the defending Super Bowl champions aren't supposed to lose by 41 points. In fact, it had never happened before. The Eagles were smacked in the face with the reality that they aren't a good team, and even if they are technically alive in the NFC East, does it really matter in the big picture? Well, it should, and there were players afterward singing that song. But there were also a bunch of leaders and veterans who couldn't even muster the courage to sell it. Fletcher Cox, voted captain for the first time this year, was one of the first Eagles to leave the locker room without talking. Jason Peters and Brandon Graham, captains last season, declined to answer questions. "There ain't nothing to talk about," Peters said. "Did you see the score?" He may have a point. But the season is far from over. Center Jason Kelce, who had spoken thoughtfully about the Eagles' struggles this season vs. last season just a few days ago, declined interview requests. He did have a legitimate excuse. "I played two or three snaps," said Kelce, who left early with an elbow injury. "I'm good." Of the locker room no-shows, the biggest surprise was Malcolm Jenkins. For five seasons, the safety has stood by his locker, through highs and lows, and answered every question thrown his way. He did his paid interview with a local station, and gave a few terse responses when stopped by a few reporters in the tunnel outside the locker room, but that was it. Jenkins has earned the right to skip out a few times. He was returning to the team that let him walk in free agency and was likely distraught. The same could be said of the other absences. It's not as much about what they didn't say as it is that they didn't feel the need to say anything at all. Eagles Zach Ertz walks off the field after the loss. Some veterans spoke. Asked to describe the mood of the locker room, tight end Zach Ertz, linebacker Kamu Grugier-Hill, and center Stefen Wisniewski said that it was a mixed bag of anger and somberness. It mostly felt like walking into a morgue. "Everybody's disappointed, obviously," Ertz said. "We got our butts kicked. The reality is we're not out of it, by any means. This performance would dictate that you could be out of it, but at the same time we're focused on improving." There was rage on the field at times. Carson Wentz tossed his helmet after the first of his three interceptions. Jenkins waved safety Tre Sullivan's low-hand slap-off after he got beat by Saints running back Alvin Kamara for a long touchdown catch. "We should be [ticked] off," Grugier-Hill said. "We just can't let that fly." But there were also signs of finger pointing. Defensive end Chris Long swung his arm toward the secondary after Mark Ingram rushed 14 yards untouched into the end zone – as if he were saying, "Someone, please, cover the left side of the field." Rasul Douglas held his arms up at safety Corey Graham after he failed to get over in time to help the cornerback on receiver Michael Thomas' 23-yard touchdown grab. Coach Doug Pederson said that he "never once" saw a lack of effort. At first glance, there didn't appear to be anything obvious. But it's up to the Eagles coach to keep his players from packing it in. Eagles head coach Doug Pederson looks over at defensive coordinator Jim Schwartz during the third-quarter against the New Orleans Saints on Sunday, November 18, 2018 in New Orleans. Pederson has faced turmoil before and at first handled it awkwardly when he questioned some players' commitment following a loss to the Bengals two years ago. But the team responded the next week and finished the season with two wins. It helped set the table for 2017's success. But this is different, and, quite frankly, Pederson's messaging has been clumsy all season. "I walked around the locker room on the offensive and defensive side and to every man I told them, 'Don't hang your head. Let's go,' " Pederson said. "We're obviously in a rough spot right here, but I believe in those players and believe in those coaches, and we'll get it fixed." News conferences aren't the place to call out players, but it may be time to start sending messages via the lineup. The Eagles are battered, and Pederson seemed to use injuries as too much of an excuse after the game. But significant changes may be difficult. He can certainly look in the mirror and at his coaching staff. The game-planning, preparation and play-calling have been inconsistent all season. What does the locker room think of Pederson and the coaching staff? That answer may come over the next few weeks. "We got good people in here," Long said. "We'll be raring to go on Monday or Tuesday trying to win a division game. And that's no B.S. I want to mope. I want to throw [stuff], but that's not going to do us any good. Execution is going to do us good." Get insights on the Eagles delivered straight to your inbox with Early Birds, beat writer Zach Berman's newsletter for Eagles fans. Click here to sign up.